The French Ambassador H.E Stephanie Rivoal has donated all Weather courts to KCCA and Uganda Police Schools. This was at the events organised by Nakivubo Blue and Kibuli Police children Primary School earlier this week. The courts were constructed using funds raised from French Uganda Week 2018 earlier on in the year. The President of the Uganda Olympics Committee William Blick thanked the French Embassy for always supporting sports since it’s one of the activities that will help improve the lives of young children to have a better future. 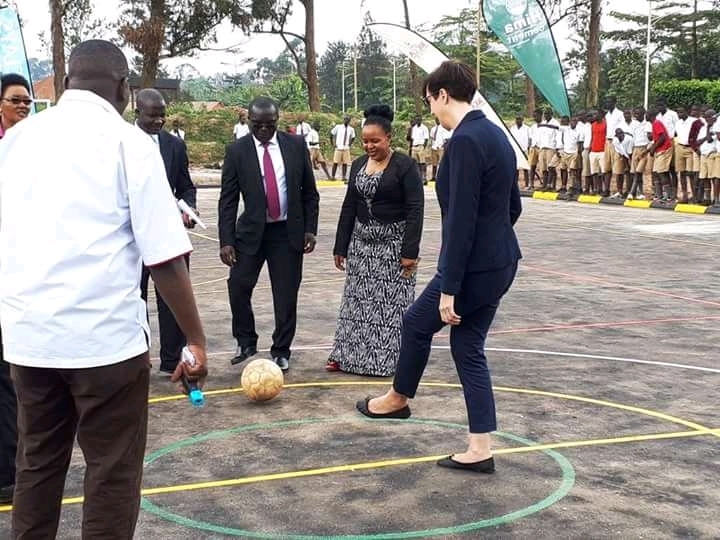 “The French Embassy in Uganda has supported sports fraternity in Uganda through games like Rugby, Football and Basket ball through their fundraising initiatives at the French Uganda Weeks, said Blick. “This is a great opportunity for the children and youngsters to take up sports as a way of life and build their Future. The France-Uganda week 2018 took place in March.